Wondering what to do with all that extra cash you'll have in your pockets once President Obama's economic stimulus plan kicks in? Well, wonder no more! 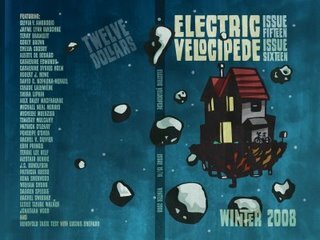 What better to spend your hard-earned bailout money on than a subscription to Electric Velocipede? Single issues are groovy confections of literary goodness, and the current offering is actually a double issue, jam-packed with more inspired writing than is oft seen on this mortal coil. And, being "electric," it emits no greenhouse gases. The fact that yours truly has a story contained therein--"A Plague of Banjos"--is merely value added. When Moses left the Pharaoh, he prayed to the Lord. A great wind arose from the west, and swept away all the locusts, cleansing Egypt. The rest of the story, of course, can be read within the pages of John Klima's Electric Velocipede.